New target 50 yards off a rest same ammo. 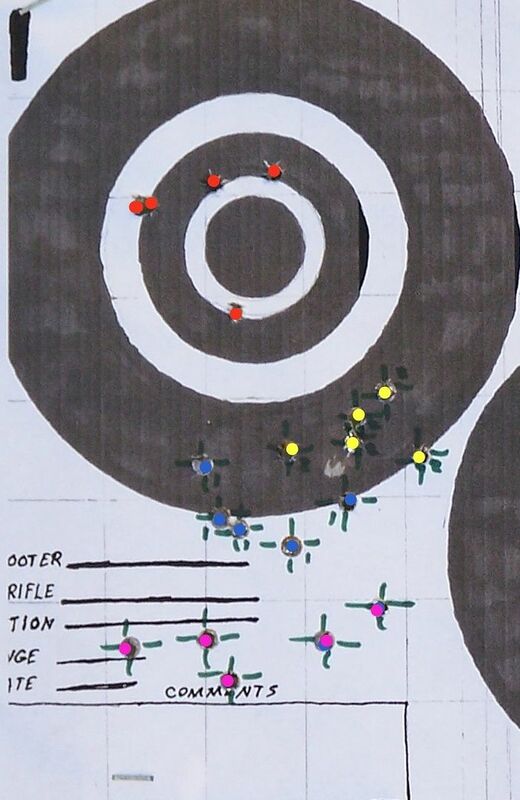 Blue is just bore sighted, yellow is up 4 clicks (I'm used to my Enfields with Parker Hale sights at 100 yards and .5 minute clicks not Redfield at 50 yards and .25 minute clicks at but I did figure it out eventually), pink is 10 clicks in the wrong direction and red is 24 clicks up. Time to try some different ammo. Going to try an early morning trip to Cabela's to see what we can get. Were you able to get it squared away? I managed to whittle the groups down to a fairly consistent 1.5 inches with some 40 grain CCI's. I think most of the problem is me not the rifle or the ammo though.